Picture this: you’re outside, getting a workout in, cycling around some interesting scenery and challenging roads. Your muscles are tense, your breathing is growing ragged, and there’s a hill separating you from a cold glass of water at home. Wouldn’t it be nice to be able to give your body a well-deserved break and let the bike take over the hard work for a while? Well, with an eBike conversion kit fitted to your bike, this is now a reality! Powerful 36V lithium battery to ensure your momentum is maintained and your safety secured. Intelligent 250W brushless front wheel motor for smooth motion and seamless transition between manual and electric riding. Three riding modes: pedal only, assisted pedal, and full power motor. With these choices, you are fully equipped to take on any challenge and tailor your riding to your individual needs. 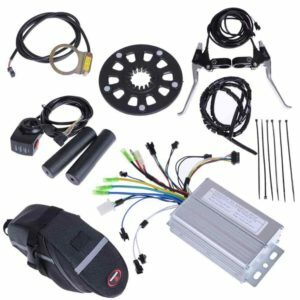 LED dashboard and thumb level throttle for increased comfort, safety, and peace of mind whilst cycling and changing gears. If these super features haven’t caught your attention, the guaranteed durability and easy maintenance will surely convince you. 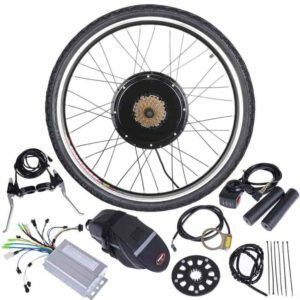 This kit is the epitome of eBike conversion technology. Go on… we know it’s a showstopper! Features: 36V lithium battery for momentum – 250W front wheel motor for a smooth ride – Triple riding modes – LED dashboard – Thumb level throttle for gear changes. 500W 36V brushless rear wheel motor for out of this world comfort, and impressive top speeds of up to 22KPH. Thumb throttle for gear changes complete with LED indication lights for added security and clarity. No moving chains or gears meaning friction is reduced and parts are less likely to sustain damage or break! State of the art pedal sensors, and automatic motor shut off with application of the breaks. If you still find yourself having reservations about this kit, never fear! The ReaseJoy 26V 500W conversion kit is also surprisingly easy to install, maintain, and charge, and the battery can be replenished in no time at all. Don’t miss out! Professional pedal assist system (PAS) to ensure that you can keep going wherever you are and no matter how tired you become. Automatic power cut of through application of the breaks to make sure no energy is wasted and that your safety is maintained. 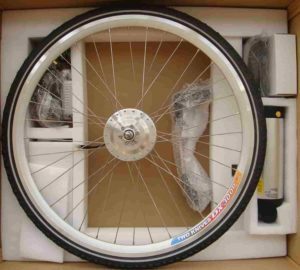 Double walled alloy rim, and reinforced spokes to withstand tension and additional weight. High international quality standards are observed and adhered to in all aspects of the product’s performance. 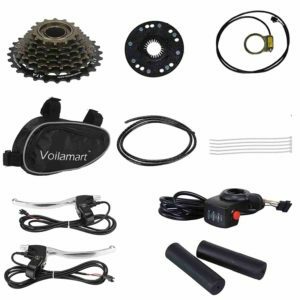 This kit is suitable for a wide range of bikes, and can be used by cyclists of any age and capability. Coupled with the features above, and the affordable price tag, why would you pass up this opportunity? Make your riding experience exceptional! 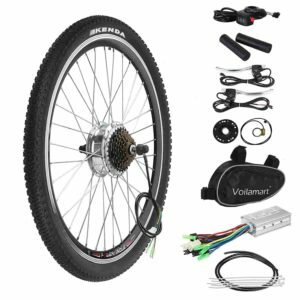 Hopefully you’ve been tempted into considering an eBike conversion kit purchase, but in case the above insight has left you overwhelmed or undecided, our recommendation is the ReaseJoy 36V 500W 26″ Rear Wheel eBike Conversion Hub. The sleek design and added features make it a definite winner. What are you waiting for?